Born on August 5, 1937, Herb Brooks grew up in a modest duplex at the corner of Payne and Ivy Streets, on the East side of St. Paul. 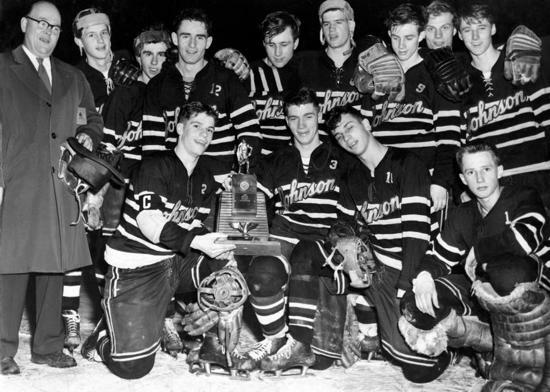 Herb got his first taste of championship hockey when he led his St. Paul Johnson squad to the Minnesota high school title in 1955. He would then go on to play at the University of Minnesota under legendary Coach John Mariucci, where he tallied 45 points from 1957-59. From there, Herbie went on to play on several U.S. National and Olympic teams from 1962-70. Brooks then got into coaching and eventually took over at his alma mater in 1972, where he led the last-place Gopher squad to an NCAA title just two years later. It would be the first of three crowns at the U of M for the coach, who added titles in 1976 and 1979 as well. Brooks was simply dominant in Gold Country, posting a gaudy 175-100-20 record along the way. "We went to the finals four of my seven years there, and we made a great run of it," said Brooks. "I think I put a lot of pressure on the players, and I had a lot of expectations of them. I didn’t give them an 'out,' and I think I was always able to find the kids who were really competitive. The common denominator of all the guys who played throughout my seven years was that they were really competitive, very hungry, very focused, and mentally tough — to go along with whatever talent they had. I think that really carried us." The next stop for Brooks is the one that will forever be linked to his legacy, the fabled 1980 U.S. Olympic team which won the gold medal at Lake Placid, NY. 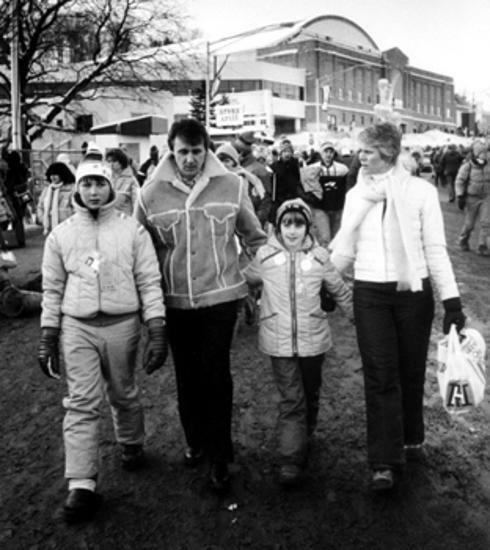 The "Miracle on Ice" would later be named as the best sporting event of the 20th century. "They were really mentally tough and goal-oriented," said Brooks of his squad. "They came from all different walks of life, many having competed against one another, but they came together and grew to be a real close team. I pushed this team really hard, I mean I really pushed them! But they had the ability to answer the bell. Our style of play was probably different than anything in North America. We adopted more of a hybrid style of play — a bit of the Canadian school and a little bit of the European school. The players took to it like ducks to water, and they really had a lot of fun playing it. We were a fast, creative team that played extremely disciplined without the puck. Throughout the Olympics, they had a great resiliency about them. I mean they came from behind six or seven times to win. They just kept on moving and working and digging. I think we were as good a conditioned team as there was in the world, outside maybe the Soviet Union. We got hot and lucky at the right times, and it was just an incredible experience for all of us." Brooks would later enter the NHL coaching ranks, first with the New York Rangers, where, after three years, he was named NHL Coach of the Year. After five seasons in the Big Apple, Brooks came home to Minnesota to take over the reigns at St. Cloud State University. 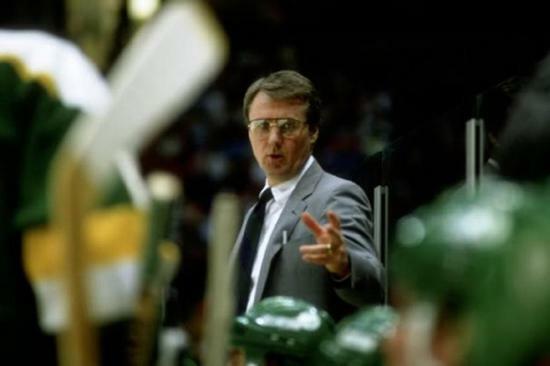 He took the program to a Division One status that next year and then stepped down to assume the head coaching duties with his hometown North Stars in 1988. After a tumultuous season behind the bench with the Stars, Brooks took some time off to embark on a successful business career which included motivational speaking, TV analysis and NHL scouting. 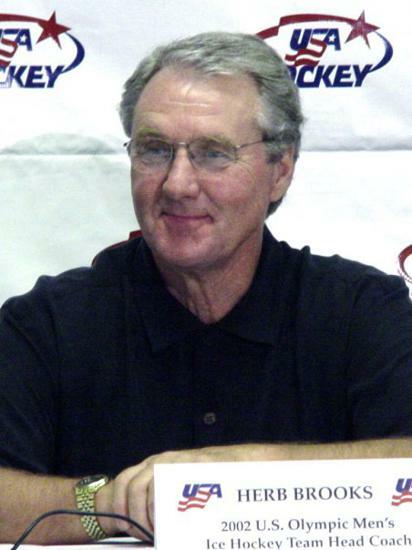 The coaching bug would bite again though, as he later took over as the head coach of the New Jersey Devils (1992) and later the Pittsburgh Penguins (1999-2000). In between, he even guided the French Olympic Team at the 1998 Winter Games in Nagano. Brooks would later lead the U.S. squad yet again, this time to a dramatic silver medal at the 2002 Olympics in Salt Lake City. Tragically, on the afternoon of August 11, 2003, Brooks was killed in a one car accident on Interstate 35 near Forest Lake, Minnesota. He was returning home from the U.S. Hockey Hall of Fame Golf Tournament in Biwabik, where he was once again doing his part to promote the growth of American hockey. He was just 66 years old. On February 5th, 2004, a statue of Herbie was erected in St. Paul's Rice Park across from the one of famed Minnesota author F. Scott Fitzgerald. It was Fitzgerald who wrote the now famous line: "Show me a hero and I will show you a tragedy." That was Herbie. 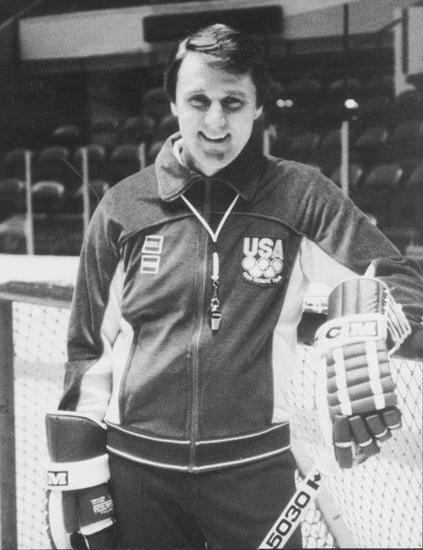 Gone from this earth, Herb Brooks has earned his place in sports immortality and will never be forgotten. One of our nation's most charismatic and inventive coaches, he was a true American hero. The preceding paragraphs are an excerpt from Ross Bernstein’s new book entitled: "Remembering Herbie: Celebrating the Life & Times of Hockey Legend Herb Brooks." A portion of the proceeds from the sale of the book will benefit the Herb Brooks Foundation. To learn more about the book or to purchase a copy, please visit www.bernsteinbooks.com.